San Juan, Puerto Rico welcomed us with a few days of rain–last thing you are looking for when escaping a cold rainy winter followed by even a rainier spring in Portland. 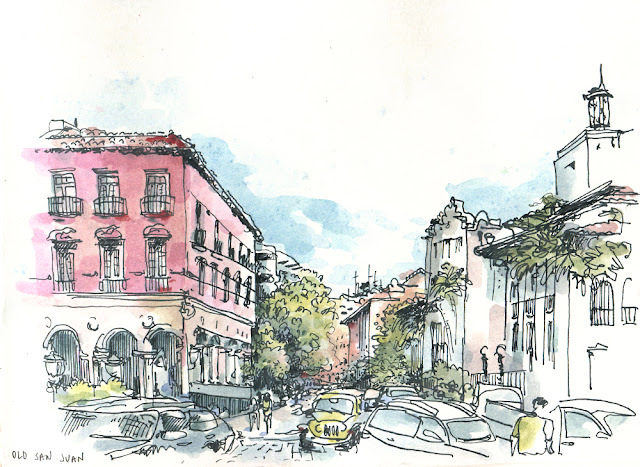 Yet we had lovely time exploring the Old San Juan, eating fresh mangos brought over by our host and sketching from this amazing roof top terrace. Some beautiful colonial buildings in Old San Juan, including the majestic US Post Office on the right. Quick sketch at the corner of Plaza de Armas in Old San Juan. A bike cop in front of me and lots of lovely Spanish balconies all around. Off to the small island of Vieques–a beautiful chill island populated by wild horses and lizards and home to some of the most spectacular beaches. My favorite inhabitant of Vieques island—the 375 year old Ceiba tree. Vieques farmers market on Tuesdays and Fridays always brings out a line of people hungry for fresh fruit and veggies. The glorious playa Caracas with all of its usual suspects. I think I have catalogued almost every beach in Vieques now. This is Playa Grande—vast, empty, rocky and grand. Every week a ferry boat brings fresh produce to the island of Vieques from the main island of Puerto Rico. Here is the view of the port Isabel II with the ferry boat arriving at sunset. After days of avocado sandwiches and rice and beans we treat ourselves to a fancy meal at El Blok. Watching men play dominoes outside with some beers and cocktails on a Saturday evening.